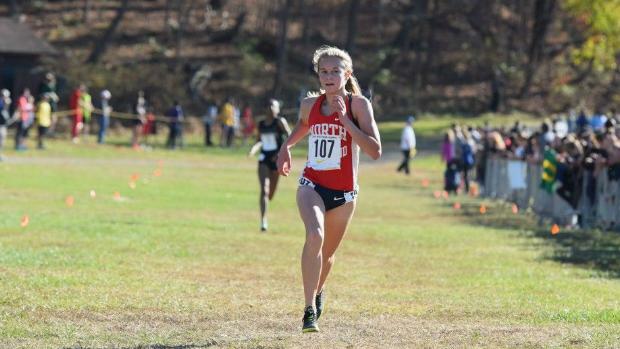 Continuing one of the strongest prep seasons in New York of all-time, Katelyn Tuohy (North Rockland) became the third girl to ever break 17:40 on the storied Bowdoin Park Course. Winning the Varsity 2 Race at the Section 1 Coaches and Officials Invitational on Saturday, Tuohy sped away from the field to establish a blistering early pace. She would cross the line nearly a minute and a half ahead of the next fastest girl. Her winning time of 17:28.6 is the third fastest in course history. Only Aisling Cuffe (Cornwall) and Nicole Blood (Saratoga) have ever gone faster. Both ran their marks at the Federation Championships, held on November 20th of their respective year. Tuohy's mark comes on Oct. 21, a full month earlier in her season than either superior time. The time also establishes a new sophomore class record on the course, breaking the previous record of 17:40 held by Mary Cain (Unattached). The future bodes well for the sophomore sensation if the trend continues. It could be possible that Tuohy was still tired from a remarkable Van Cortlandt Park Record the week before, and with a quick Grout Run the week before that. Early reports have Tuohy instructed not to go all-out in the race, and yet, the quick time still came. She was seen doing a full workout after the race. Hear from Tuohy, see race video and photos, and more tonight after the conclusion of the meet. **Denotes multiple instances in "Top Times Ever Run"